All Entries Tagged With: "jigging"
The ice has been hit or miss so far in 2017. Ice one week. Open water the next. Although many think this is a bad situation, seasoned veterans like Pro Raymond Tiffany take full advantage of this situation. Catching Walleye with Yukon Minnows! Just ask Cody Caraway about catching walleye. 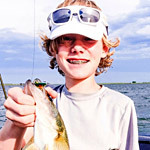 Cody is pictured here with a nice South Dakota walleye caught using a Yukon Minnow. Brad Caden recently had a great day of ice fishing. Armed with his ice fishing gear and some of his favorite Skandia Tungsten jigs, he hit the ice near Cement City, Michigan. This is kind of a fishing report with a story from my ice fishing day on Lake Lansing yesterday January 24, 2016. It includes two videos for evidence or documentation. 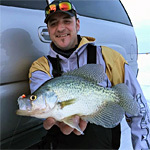 However, don’t over look the other panfish species including the Crappie. 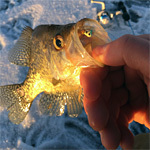 Experienced ice anglers know this can be one of the best times of year to catch these giant panfish. Enter K&E Tackle’s flat-bottomed Skandia Tapiola Jig. 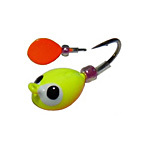 The design is based on satellite technology that allows for maximum signal strength as similar sized jigs. 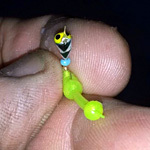 Here’s a tip for guys that love to vertically jig for walleyes! When you find walleyes stacked up on a break, hole or rock pile and you want to stay on top of them, try the Yukon Shiners! 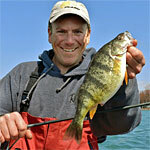 When the panfish bite slows, it’s time for a change to break free of the mid-winter doldrums. It’s time for a whitefish ice fishing road trip. New Yukon Shiners and Yukon Spoons! K&E Tackle would like to introduce you to the NEW Sitka Yukon Shiners and the Sitka Yukon Spoons. 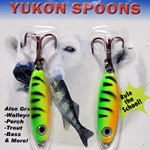 Yukon Shiners are a jigging minnow type lure, while the Yukon spoon is modeled after your traditional spoon. Each year lakes freeze, suspended particles settle and the water clears, sometimes to the point that you are able to see many feet down your hole. For die-hards like Joe Balog willing to chase Lake St. Clair’s jumbo yellow perch late into winter, the best fishing is just beginning. 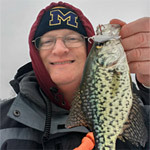 Predicting the ice fishing season on Lake St. Clair used to be easy but these in-between ice conditions provide new perch fishing opportunities for anglers willing to make the necessary adjustments. 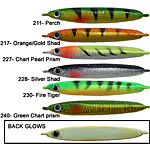 Of course you can’t eat these Smelt Sticks but what you catch with them, you sure can. 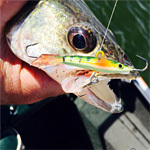 K&E Tackle’s Smelt Sticks feature a drop-chain leader with a gold hook. 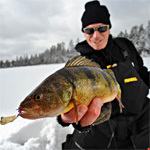 North Dakota’s Winter Gold – Jumbo Perch! When you hear the words Ice Fishing what is the first thing that comes to mind? For me it’s the sight of a jumbo perch surpassing a pound and a half sliding up a hole. 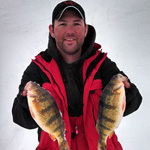 Stopper pro staff Keith Stanton and Bill Ferris are putting on ice fishing seminars at Jays Sporting Goods in Clare Michigan Sunday January 20th. With the mild weather keeping many ice anglers frustrated, some fishermen are getting creative to catch their first ice gills. 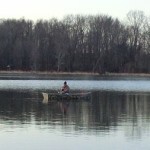 This angler was spotted on a lake in Barry County in a borrowed duck boat and was able to catch a dozen nice bluegills in about half an hour of fishing. 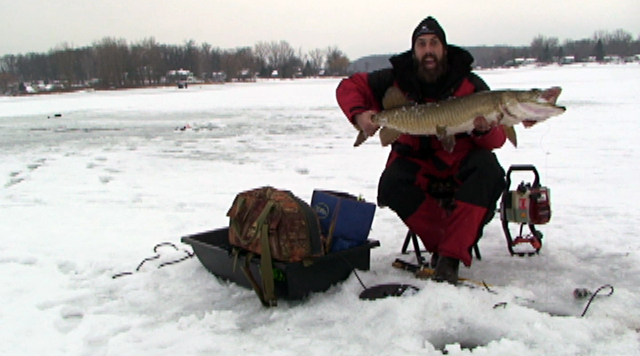 Ice fishing expert Keith Stanton shows a few of the giant Northern Pike and Muskellunge he’s jigged or speared through the ice in this picture gallery! Light Line’n Trophy Trout through the Ice! The ice is in and safe. The weather is perfect and you just received word that the trout are hitting in the local Lake Michigan tributary or marina. 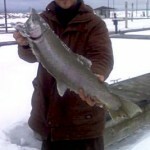 If you enjoy ice fishing anywhere in the Great Lakes Region, you'll enjoy Great Lake Ice Fishing. 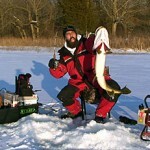 Please join the community forum and share your ice fishing reports & adventures. SKANDIA Tungsten Ice Jigs New Colors! 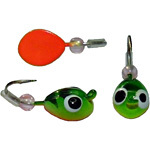 Wonderbread Skandia Pelkie Tungsten Ice Jigs! GLIF is offering a FREE Skandia Tungsten Jig to the next 100 new members who join our new community website. Click here for details or visit Member Promos! There are still jigs available so sign up now! No upcoming events in the near future. 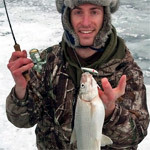 © Copyright Great Lakes Ice Fishing 2011 – 2019. All rights reserved.